DNA replication – the process of copying the DNA each time a cell divides – must be completed accurately to avoid mutations that cause cancer and other diseases. 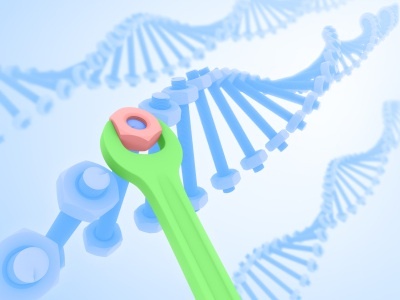 The DNA damage response protein SMARCAL1 recognizes stalled replication “forks” and remodels the DNA to allow repair and restored replication. SMARCAL1 is essential to maintaining genome integrity during replication, but how it works is poorly understood. Now, Brandt Eichman, Ph.D., and colleagues have determined the crystal structure of a region of SMARCAL1 (the HARP domain), which is fused to a motor domain. They used X-ray scattering to examine the conformation and assembly of the HARP domain in solution and found that the domain is conserved with DNA damage recognition domains from other DNA repair proteins. They showed that the HARP domain is a functional substitute for one of these regions and that mutations of predicted DNA-binding amino acids in the HARP domain reduced its ability to bind to replication forks and facilitate repair. The studies, reported in the Proceedings of the National Academy of Sciences, uncovered a conserved recognition domain in DNA repair enzymes. This domain couples DNA recognition and remodeling and plays an important role in stabilizing replication forks and maintaining genome integrity. The structure also illustrates the location of several SMARCAL1 mutations that cause Schimke immuno-osseous dysplasia (SIOD), a multi-system disorder characterized by growth defects, immune deficiencies and renal failure. The findings are the latest in an ongoing collaboration between the teams of Eichman, associate professor of Biological Sciences and Biochemistry, David Cortez, Ph.D., professor of Biochemistry and Cancer Biology, and Walter Chazin, Ph.D., Chancellor’s Professor of Biochemistry and Chemistry. Together, the researchers aim to understand how DNA replication happens faithfully so that every cell ends up with exactly the same DNA – and without damaging mutations. The research was supported by a pilot grant from the Vanderbilt Center in Molecular Toxicology and by National Institutes of Health grant CA136933.